Earlier this year, the Helix Institute of Digital Finance conducted a nationally representative survey of 2,800 mobile money agents in Bangladesh, coupled with qualitative interviews across the country. The 2014 Bangladesh Country Report provides insights into some of the unique models and innovative techniques players in this country have designed to develop an agent network of more than 80,000 agents in under four years. Note: The blog was originally posted at http://helix-institute.com/blog/bangladesh-pioneering-unique-models-innovations-agent-networks. 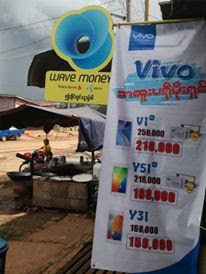 Mobile Money Asia has agreed to cross promote the blog at the request of the authors. I'd suggest 80,000 agents is actually twice as many as there should be; but conscious every implementation is different. Wing in Cambodia aims at what it believes is the sweet spot of one agent per 3,000 adults for its current stage of growth. This results in 2,500 Wing Cash Xpress outlets for Cambodia. Having too many agents impairs the profitability of the network, leading to agents who do not feel incentivized to focus on quality service. They will turn customers away, over charge customers (particularly OTC which is hard to catch), or be tempted to develop intricate fraudulent transactions to generate income. The number of outlets must be balanced very carefully. Without knowledge of Bangladesh specifically, the comment of too many competing agents also suggests agents are too close to each other. To combat this in Cambodia, strict spacing requirements are imposed & tracked via GPS coordinates to ensure Sales staff are not able to cheat the paperwork - spacing is crucial. During the 'growth' phase, a 'master' agent network does prove useful if incentivized; but ideally the long term structure should be totally flat. Having 'runners'or worse still, company staff, handling cash is a huge risk and open to abuse. One often overlooked yet crucial element of Mobile Money is that agents will generally rely on the use of traditional MFI & bank networks to manage their liquidity (cash & digital) properly. In Wings case, the company bears the cost of such transactions; the big banks do the heavy lifting of cash, but is something that a mobile money company might need to take on if bank fees are exorbitant. With the right distribution you should see agents becoming dedicated as Mobile Money income eclipses anything their traditional business generates (unless they add staff to cope with both) - wing agents generally become full time dedicated mobile money outlets, and add staff as they hit 300+ transactions per day. Crucially, once agents hit significant income, they become a dream to manage. With a zero tolerance approach to poor customer service, agents stand to lose a huge amount with just the smallest mistake - consequently they will raise their game and become an extension of the staff, living the company values and effectively self policing.